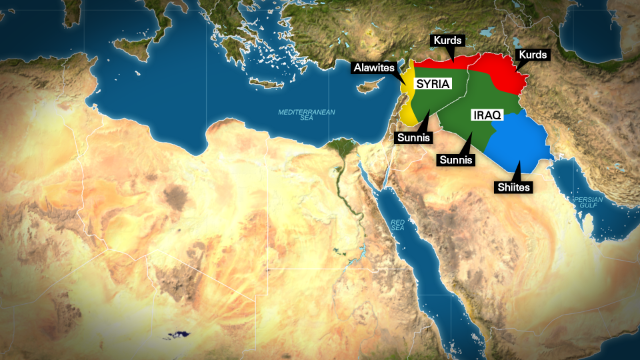 A new map for the Middle East? Fareed speaks with Robin Wright, author of Rock the Casbah: Rage and Rebellion Across the Islamic World, about tensions in the Middle East. You had a terrific piece in The New York Times a year ago that struck me in which you mapped out a new Middle East based on really, the realities of the ground. Describe for us what the new map of the Middle East looks like. Well, in the aftermath of the Arab uprisings, we saw a kind of combustible situation emerge that allowed rival ethnicities and tribes and religions begin to fight for their rights with dictators now absent from the scene. And that exploded. Syria, of course, lit the match. And we're now seeing Syria already at least into three different pieces. And that has been explosive in rippling across borders, challenging traditional boundaries established a century ago. We see that play out in Iraq today, where we see the emergence again of at least three different parts of the country – the Kurds particularly in the north, almost kind of de facto establishing their own boundary with the rest of Iraq by deploying Peshmerga, their own militia, along that border. But it plays out not just in this part of the Levant. It is also playing out in North Africa, where you see the end of Gadhafi's rule three years ago unleashing again rival tribes and all the sources of identity that come alive again. And here we're seeing in Libya those who live around the capital in Tripoli looking increasingly toward the western Islamic world and those in Benghazi looking toward the eastern Islamic world. And they have been longstanding rivals over resources and power. And then you have the south, which is much more like Africa than it is like North Africa. And so you see these dynamics that are rippling across the region. For decades Arab autocrats resort to regime violence to impose unity on multi-ethnic societies. Yet they are ethnic- and tribal-minded. Following their belief, "blood is thicker than water", they see have incentive to accommodate religiously diverse societies.Their borders were finalised after WWI and came under British and French rule until they became independent. Unfortunately power-holders couldn't cope with challenges of modernity, so the Arab uprisings in 2011 caught them flatfooted. Joe Biden had the right idea back in 2006 but unfortunately, too many people were just too plain ignorant to realize it. Besides, the Kurds do have a right to set up their own home state just as the Israelis did back in 1948! Yrs indeedy,, @ My Troll, anybody has a right to obtain land through conquest and establish a nation. That's how the fittest survive. So far, the human race has survived. References: the USA, and later, Zionism. Aussi, @ My Troll, by the same Universal Law of Truth, Palestinians forever retain that same right. They, however need a lot of practice before prime-time exposure. I hope all peoples find a way into a more just world. As long as we view ourselves with an eye on our cultural, religious and previously believed ideologies we will have lines on the man made map. This seems true in the short term. Americans may feel immune from changes on a map but I have reservations. Our continued focus on the affairs of others may find us wandering away from a more relevant perspective. Iraqi Kurdistan is a De-facto state since 1991 but never recognized by the international community. Now it's the time to recognize the sovereignty of Kurdistan. Many of today's borders in the Middle East, including Iraq, are the consequence of past wars (in which winners took territory from losers) or were forced arbitrarily by third parties like colonizers, especially, Great Britain, this was a mistake. Now is time to correct such fault, and recognize the fact. Let us welcome a new state to the international system, the Republic of Kurdistan. If ALL parties involved dont agree it will never work. And im saying the ones ACTUALLY involved...not outsiders like the US. There will continuelly be conflict like Israel and Palestine. Its not pretty but it is how it is. Umm, sort of missing the new Islamic State? Doesn't seem all that complicated to draw an accurate map as reality on the ground dictates right now. Thanks Fareed for telling us the 'Reality' on the ground. Now we know what is real we won't object to American money and force being used to bring it about. The whole Mediterranean Area would benefit with PEACE. Let´s do PEACE. will be brought by war. All this talk about pieces and the way Iraq looks on the map is making me hungry for a pepperoni pizza. I am glad I don't live there. They are near Africa. And we all know what Africa has. Chrissy? Is that really necessary? I second the motion from farhard. may the kurds have some land. And be happy. ~_`, translation: hi. How are u? Robin Wright has said it all. Trying to keep Iraq together is a folly as anyone with half a brain would know. Iraq was never united by the Iraqis themselves but by the French and British in 1919! Vapid, My Troll. Don't try to hijack me with a cliche. If it does, tawab1, the current bloodshed will only continue!!! Kurds are the biggest nation in the world that still has not independence but now its about time and each country should support at our independence. Turkey has Kurdistan, Iraq has Kurdistan, Iran has Kurdistan but Kurds has'nt Kurdistan! I am proud to say that we have bee able to increase safety here in Kurdistan. Kurdistan surrounded by Terrorist grupps but up to the present they have'nt been able to perform any act at war. Kurdistan is a home to everyone and now lots of Iraqi leaders have hidden their selves in Kurdistan and even Nouri Al Mali at Sadam Husein time he was not allowed enter Iraq so he was also in Kurdistan that time but now he is acting like a dictator against Kurdish and Sunni mulims! And now we insist on a country of our own! I am waiting for the great omen to hear Kurdistan has been an international country. With this, Pshdar, I couldn't agree more!!! Thank you. It is not that simple, this division will cause more havoc in the region. In this map Damascus ( mainly Sunni) is included in an alawi state, and large parts of the Syrian- Turkish border is given to a Kurdish state when it is mainly inhabited by Turkmen and Arabs. Plus, how could you put the historic enemies ( Kurds and Assyrians) in one state?? Then.. What about the strong Arab tribe in the Kurdish state?? They will not be kicked without a fight. The new Map looks pretty tidy to me. The Kurds deserve their own territory as they have defended their people and cities/towns against the militant Insurgents. So, let them break up along their ethnic, sectarian and religions/tribal lines and let everyone live in peace thereafter! Good post, Pro-active. That's what I say! If this mess ends up with the Kurds finally getting their own country, that will be a silver lining. If somehow the Palestinians can also get their own peaceful homeland, it would become gold. We change the map once again over war.once again just like throughout history.. .. Why is only Israel considered an illegal country which stole the land ? Get real Jew haters... How would you like to live next to people out of control.. I can only say get a job.. work for a living like the rest of us or starve.. you are a welfare state with your leaders living good , and using the rest of you as pawns..
Because Israel did steal land. It has nothing to do with their jewishness. Whether it was chinese, russians or martians, it doesn't matter, the point is that people that considered themselves a nation lost their land and homes and aren't allowed to come back. Sound familiar? It is mind boggling that jews who have been persecuted for millennia by Europeans and others, who were exiled from their nation by the Romans, would do the same to the population that was living there and know no other home. I'm a Palestinian and I support a nation for the Jews since what has happened to them over the millenia was unjust, and that nation should be in what is present day Israel. What I don't support is the way they did it. Sneaking in illegally while the British were the occupiers and then unilaterally declaring themselves a nation. Had they come to the arabs with the idea right from the beginning and tried to convince them as opposed to unilaterally taking people's homes I think it would have been supported, not at first, but eventually. That little sliver of land could have been a model for the world in how to live and work with each other but instead is a model of how to disguise apartheid and slow genocide, genocide is not just killing its also displacement. It's the complete wiping out of a people. And that's what the palestinians have been suffering since Israel was formed. The palestinians fought the british occupiers too, was it because they were jewish? or because they love tea and crumpets? It was because they forced themselves as masters. Much as i hate to say this @ Ron...we do live next to people "out of control" only in this country they are called Republicans or Conservatives, with the most extreme of the lot calling themselves "teaparty"! Considering that it was primarily Britain and France that created the borders of the current mideast I think its obvious that the borders need to be redrawn. The Brits and French drew the borders either arbitrarily and ignorantly or it was part of strategic thinking to make sure that these countries are busy fighting themselves as opposed to working together and developing. Either way it was wrong and needs to be solved. Haters always point to the developing world and say that even though they've been around for 1000's of years they are still not developed and are always fighting, while the US is relatively younger and is already stable etc. The fact is the US is NOT younger than these nations, the US was around since 1776 while the mideast nations (and a lot of the world really) only achieved independence from European invaders in the 20th century. Also consider that the US is stable because it's protected by two oceans, the mideast is right in the middle of the world map and has had outside influence and pressure on it forever. The US was unstable the same way, with its constant battles against the Native population and then with its civil war, but after that period is the way it is now. I'd say give them a referendum and ask if people want to be separated from the various groups in their nation. If the majority say yes then it should be done. Before any split however, there needs to be a conversation between the supporters of the idea and those that oppose it to try to convince them of the prospects and viability of the idea. Supportive nations and the UN should then help each of the nations that need the help after the split, i.e. those that lose resources for example. However, ideally, the region that has all the resources (i.e. oil) can/should assist the regions it split from with a cheap supply for example. seems good, muslims have always been unfriendly with everyone (themself & non-muslims) ...........this is perfect example. Once again. The only easy to conquer the Arabs, is dividing them again....... till when ???? Once again. The only way to conquer the Arabs, is dividing them again....... till when ???? Kurds are not Arab, Iranian or Turk. They are the largest nation on earth without home state. It was divided between, Arabs, Iranian and Turks. It is time to support Kurds for the unified state.